Kahkeshani, N., Hadjiakhoondi, A., Maafi, N., Khanavi, M. (2015). Standardization of a galactogogue herbal mixture based on its total phenol and flavonol contents and antioxidant activity. Research Journal of Pharmacognosy, 2(1), 35-39. N. Kahkeshani; A. Hadjiakhoondi; N. Maafi; M. Khanavi. "Standardization of a galactogogue herbal mixture based on its total phenol and flavonol contents and antioxidant activity". Research Journal of Pharmacognosy, 2, 1, 2015, 35-39. Kahkeshani, N., Hadjiakhoondi, A., Maafi, N., Khanavi, M. (2015). 'Standardization of a galactogogue herbal mixture based on its total phenol and flavonol contents and antioxidant activity', Research Journal of Pharmacognosy, 2(1), pp. 35-39. Kahkeshani, N., Hadjiakhoondi, A., Maafi, N., Khanavi, M. Standardization of a galactogogue herbal mixture based on its total phenol and flavonol contents and antioxidant activity. 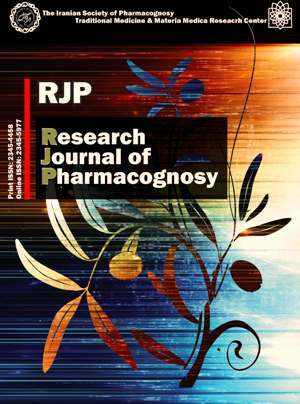 Research Journal of Pharmacognosy, 2015; 2(1): 35-39. 2Department of Pharmacognosy, Faculty of Pharmacy, Tehran University of Medical Sciences, Tehran, Iran. Department of Pharmacognosy and Medicinal Plants Research Center, Faculty of Pharmacy, Tehran University of Medical Sciences, Tehran, Iran. 3Department of Pharmacognosy, Faculty of Pharmacy, Tehran University of Medical Sciences, Tehran, Iran. Department of Pharmacognosy and Traditional Iranian Medicine Research Center, Faculty of Pharmacy, Tehran University of Medical Sciences, Tehran, Iran. Background and objectives: Dairy companies always try to increase the quantity and quality of milk production. According to the positive impact of different plants on milk production of cattle, this study was carried out to standardize a galactogogue herbal mixture based on its total phenol and flavonol contents and antioxidant activity. Methods: A mixture of Galega officinalis L. and Nigella sativa L. powders (4:1 w/w), which had shown milk stimulating activity on Holstein cows in a previous study, was extracted with hydro alcoholic solvent (80% aq. methanol) and its 1,1-diphenyl-2-picryl-hydrazyl (DPPH) radical scavenging activity and total phenol and total flavonol contents were measured according to standard methods. Results: The inhibition concentration 50% (IC50 ) value of radical scavenging activity in DPPH test and the total phenol and total flavonol contents were found to be 154.29 µg/mL, 77.720±0.104 µg of gallic acid equivalent (GAE) and 0.231±0.018 µg of quercetin equivalent (QE) per mg of dry extract, respectively. Conclusion: This herbal extract can be standardized based on its antioxidant activity or total phenol and total flavonol contents and the standardized extract can be formulated as a veterinary galactogogue supplement. Owens WE, Nickerson SC, Boddie RL, Tomita GM, Ray CH. Prevalence of mastitis in dairy heifers and effectiveness of antibiotic therapy. J Dairy Sci. 2001; 84: 814-817. Broudiscou LP, Papon Y, Broudiscou F. Effect of dry plant extracts on feed degradation and the production of rumen microbial biomass in a dual out flow fermenter. Anim Feed Sci Technol. 2002; 101(4): 183-189. Tedesco O, Tava A, Galletti S, Tameni M, Varisco G, Costa A, Steidler S. Effect of silymarin, a natural hepatoprotector, in periparutien dairy cows. J Dairy Sci. 2004; 87: 2239-2247. Wenk C. Herbs and botanicals as feed additives in monogastric animals. Asian-Australasian J Anim Sci. 2003; 16: 282-289. Abo El-Nor SAH, Khattab HM, Al-Alamy HA, Salem FA, Abdou MM. Effect of some medicinal plants seeds in the rations on the productive performance of the lactating buffaloes. Egypt J Nutr Feeds. 2007; 3: 31-41. Kholif AM, Abd El-Gawad MAM. Medicinal plants seeds supplementation of lactating goat’s diets and its effect on milk and cheese quantity and quality. Egypt J Dairy Sci. 2001; 29: 139-150. Zargari A. Medicinal plants. Tehran: Tehran University Press, 1989. Hosseinzadeh H, Tafaghodi M, Jalal Mosavi M, Taghiabadi E. Effect of aqueous and ethanolic extracts of Nigella sativa seeds on milk production in rats. J Acupunct Meridian Stud. 2013; 6(1): 18-23. Baraaj AH, Al-Khateeb HM, Al-Mahdawi FA. Morphological studies on the effect of Nigella sativa seeds on the mammary gland of mature male Norway rat. Um-Salama Sci J. 2009; 6(1): 123-128. Gonzalez-Andres F, Redondo PA, Pescador R, Urbano B. Management of Galega officinalis L. and preliminary results of its potential for milk production improvement in sheep. New Zeal J Agr Res. 2004; 47: 233-245. Miller JK, Brzezinska-Slebodzinska E, Madsen FC. Oxidative Stress, Antioxidants, and Animal Function. J Dairy Sci. 1993; 76(9): 2812-2823. Spears JW, Weiss WP. Role of antioxidants and trace elements in health and immunity of transition dairy cows. Vet J. 2008; 176: 70-76. O’Connella JE, Fox PF. Significance and applications of phenolic compounds in the production and quality of milk and dairy products: a review. Int Dairy J. 2001; 11: 103-120. Shirkavand M. Investigation of Ranunculaceae plants extract effects on milk quality and quantity in Holstein cows. VMD Thesis. Faculty of Veterinary, Tehran University, Tehran, Iran, 2012. Kahkeshani N, Farahanikia B, Mahdaviani P, Abdolghaffari A, Hassanzadeh GH, Abdollahi M, Khanavi M. Antioxidant and burn healing potential of Galium odoratum extracts. Res Pharm Sci. 2013; 8(3): 197-203. Sampietro DA, Sgariglia MA, Soberón JR, Quiroga EN, Vattuone MA. Cholorimetric reactions. In: Sampietro DA, Catalan CAN, Vatiuone MA, Eds. Isolation, identification and characterization of allelochemicals/natural products. New Hampshire: Science Publishers, 2009. Hajimehdipoor H, Adib N, Khanavi M, Mobli M,. Amin GR, Hamzeloo-Moghadam M. Comparative study on the effect of different methods of drying on phenolics content and antioxidant activity of some edible plants . Int J Pharm Sci Res. 2012; 3(10): 3712-3716. Jafari S, Moradi A, Salaritabar A, Hadjiakhoondi A, Khanavi M. Determination of total phenolic and flavonoid contents of Leonurus cardiac L. in compare with antioxidant activity. Res J Biol Sci. 2010; 5(7): 484-487. Editing committee of Iranian Herbal Pharmacopoeia. Iranian Herbal Pharmacopoeia. Tehran: Ministry of Health and Medical Education/Food and Drug Administration, 2002. Champavier Y, Allais DV, Chulia AJ, Kaouadji M. Acetylated and non-acetylated flavonol triglycosides from Galega officinalis. Chem Pharm Bull. 2000; 48: 281-282. Peirs C, Fabre N, Vigor C, Long C, Gao M, Fouraste I. Triterpenoids from the aerial parts of Galega Officinalis. Electron J Nat Substances. 2006; 1: 6-11. Paarakh PM. Nigella sativa Linn. A comprehensive review. Indian J Nat Prod Resour. 2010; 1(4): 409-429. Meziti A, Meziti H, Boudiaf K, Mustapha B, Bouriche H. Polyphenolic profile and antioxidant activities of Nigella Sativa seed extracts in vitro and in vivo. WASET. 2012; 6(4): 24-32. Abdalbasit AM, Ramlah MI, Maznah I, Norsharina I. Antioxidant activity and phenolic content of phenolic rich fractions obtained from black cumin (Nigella sativa) seedcake. Food Chem. 2009; 116: 306-312. Kiselova Y, Ivanova D, Chervenkov T, Gerova D, Galunska B, Yankova T. Correlation between the in vitro antioxidant activity and polyphenol content of aqueous extracts from Bulgarian herbs. Phytother Res. 2006; 20: 961-965. Mokhtari B. Scientific name identification, phytochemical and antioxidative investigation and flavonoids quantification on a Cuscuta species. PharmD Thesis. Tehran: Faculty of Pharmacy, Tehran University of Medical Sciences, Tehran, 2010.